Plants inside the home provide a relaxing atmosphere and have a natural ability to absorb compounds in the air that could potentially harm your health. Like all plants, houseplants produce oxygen during the day and carbon dioxide in the evening. However, some houseplants produce more oxygen than others. 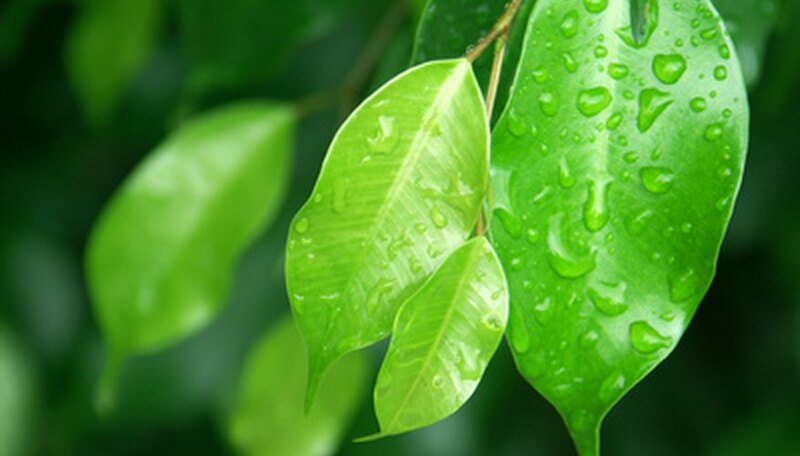 The ficus (Ficus benjamina) is also called a weeping fig. It is one of the few common houseplants widely available that grows into a woody tree form with adequate light levels. If left to grow without proper pruning, the ficus tree grows as large as growing space permits. One of the advantages to growing a ficus tree is that it can grow large while planted in a small pot relative to its size. The ficus as attractive bright green leaves, but variegated leaf varieties are available. The kimberley queen fern (Nephrolepis obliterrata) does not need constantly moist soil and can be allowed to dry out between waterings. The kimberly queen fern thrives in higher light levels. It is more adaptable to indoor areas with low humidity levels, such as an office of home, and grows best in temperatures of 60 to 75 degrees F.
English ivy (Hedera helix) is a dark-green ivy that climbs by aerial roots. It can be trained on a small supporting structure attached to a pot or allowed to cascade from the container. When grown indoors, pinch off the plant's ends to keep it under control. It prefers a moist, but not wet environment that can rot the plant's roots. Provide bright, but not direct, sunlight for English Ivy to thrive. The snake plant (Sansevieria trifasciata) is also known as a mother-in-law's tongue and is one of the most durable houseplants. It grows in most locations in the home, except dark corners or windowless rooms. The plant can dry out between watering. The roots hold a lot of water relative to their size, and a container holding a snake plant can be surprisingly heavy. Because of its upright habit, the snake plant takes up little space. The bamboo palm (Chamadorea elegans) is a tender, leafy palm tree that prefers damp, but not wet, soil and a bright light location. It is large for a houseplant and grows to 5 feet tall and 3 feet wide. In ideal conditions, the bamboo palm or parlor palm can produce small flowers and berries. The bamboo palm is not tolerant of cool conditions and prefers temperatures between 65 and 85 degrees F.
Spider plants (Chlorophytum comosum), or airplane plants, have long, narrow dark-green or variegated leaves. They have an interesting feature that is the ability to reproduce by sending off baby plants with roots already attached at the end of long aerial stems. They grow best in moist soil by a sunny window. If they wilt or decline because of neglect, they easily recover with proper care, which includes extra moisture and regular fertilization with the correct level of a water-soluble houseplant fertilizer. The peace lily (Spathiphyllum) has numerous broad green leaves and has the distinct feature of being able to grow in lower light levels than most houseplants. It grows in moist soil in temperatures between 60 and 80 degrees F. It cannot be exposed to direct sun for more than a few minutes without damage to the foliage. The peace lily produces white, long-lasting blooms on the end of long stems. Peace lily plants can live for decades if cared for properly. Golden pothos (Epipiremnum aureum) is a common houseplant. The heart-shaped, variegated leaves are attractive, and the vines can grow as long as 10 feet if the plants are given a constant level of moisture. Golden pothos grows in most light levels and is an ideal plant for the home or office. The plant is easily pruned back to shape if it outgrows the container. Dracaena (Warneck dracaena) is a broadleaf plant with lime-green leaves and lighter green stripes running along the leaf edges. It is an easy-to-grow plant that does best if given a regular application of water-soluble houseplant fertilizer. It grows well in at least four hours of indirect light. Although the Dracaena prefers moist soil, the container must be well drained so the root system does not sit in water. Elephant ear philodendron (Philodendron domesticum) has arrow-shaped leaves and an upright growth habit. The elephant ear philodendron grows well in moist soil and exposure to at least four hours of indirect sunlight each day.